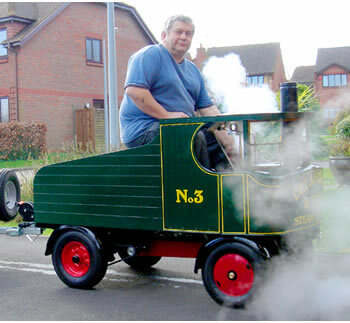 This is a large model of the popular Sentinel steam wagon as made and used extensively in England up to the 1930s. Maxitrak chose the short wheelbase tractor unit as their standard model as this enables the lorry to be accommodated in a 6ft by 4 ft trailer for storage and transportation. Once the Wagon is on site and steamed up the trailer can be then used for carrying extra passengers. At nearly three feet across the body is wide enough to allow two adults to sit side by side, while a third adult or two children can sit behind the drivers seat. It is large enough to be steamed on the rally field along with other 1/3 scale, 1/2 scale or full size engines. It has a coal or gas fired vertical boiler fitted with an injector delivering steam to two cylinders under the floor. These drive the back axle through gear and chain reduction with a differential.